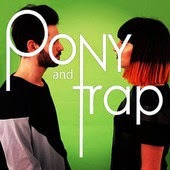 Sometimes an EP can really surprise a reviewer (or, indeed the listener in general) and the Time To Engage EP from Pony And Trap is certainly one of them. Offering a sound that catches your ear with the subtlest of taps on the drum, you can’t but love the fresh sound on offer here. Of course, there’s one comparison that could be made and is in one sense quite true. The touch of a certain White Stripes is evident on the smart but humorous lyrics but as far as the whole package goes the band is certainly doing their own thing. There is a certain ‘English’ sensibility to the way the words characterise the songs and if you check out the video for the title track you will note a certain flair for visual humour as well. Over just twelve minutes Pony And Trap do nothing less than engage with the listener in the most rhythmic of terms with the rest forming a cloud of approval as the record goes on. Of course, this being an EP it can’t get much longer and that makes it all the more special. If there was one more song here, it feels as if that certain click in the atmos when you hear music that you like would not come so easily. But, with possibly the best marketing –slash –hint imbued title you can conjure up the duo do much good.